Premium 35 HP Kohler industrial engine is backed by the manufacturer’s three year warranty. >Finally, a truckmount that delivers the flow AND heated pressure you need to rapidly clean tile, grout, stone, concrete and more. Plus, the unit offers true versatility: use as a powerful carpet cleaning truckmount, or for restoration extraction and cleanup. 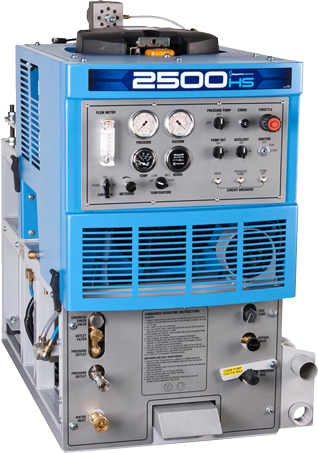 The 2500HS gives you the edge over unheated units, plus delivers more vacuum, more solution pressure and a faster, deeper clean. The 2500HS is ideal for the carpet cleaner wishing to expand into the lucrative hard surface cleaning business. Hard surface cleaning is one of the fastest-growing segments of the cleaning business, and with square-foot billings often twice as much as carpet cleaning, it’s easy to see why.